It’s been a while since we did a Wear Your Style Friday. Sorry about that. I think you’ll agree that this week’s is really good. I’d like to introduce you to Dorie of Tumbling Blocks. I’ve been following Dorie for a while now, so I sort of feel like I know her, and when she posted her adorable version of the Portfolio Tunic to the Flickr group the other day I was really excited to see it. I chose the portfolio tunic because I loved its modern shape, and the interesting construction of the sleeves and pockets. I’m on the short side (5′-2″), and I know that the lengths of most dress patterns are way too long for me, which made me think that the tunic length could probably even work well for me as a dress. I used an egg blue linen fabric. I had thought about using a voile print, but decided that the unique shape and details of the tunic would be more visible in a solid. 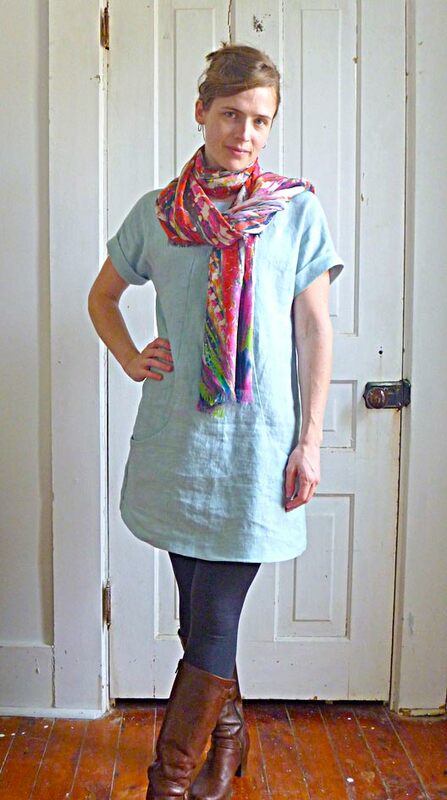 The linen feels good over leggings for spring, and if our spring ever stops acting like summer, I’ll wear the tunic styled with the leggings, boots, and a bright scarf. I think the tunic will work well on its own for those really hot days when you don’t event want to think about how you used to wear an extra piece of fabric around your neck. Dorie also styled her tunic for summer, and you can see it over on her blog post. Thank you…I had been missing the Friday styles. I look forward to them each week. I hopped on here Monday and saw this Friday styles thing….very cool…I loved her version of the tunic and her site is super cool too! That tunic top is urban chic. I am a fashion designer for Yours Elegantly an online tunic tops for women site that donates part of its proceeds to Women’s welfare organizations. What I like is the simplicity and the scarf pulls it all together well. Tres Chic!